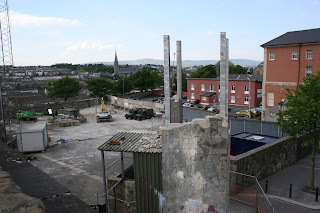 The army watchtower at the top of Bishop Street in Derry within the city walls will soon be completely demolished. This is how the workmen were getting on when I walked past it on Wed 30 May. My photo is from the nearby city walls. 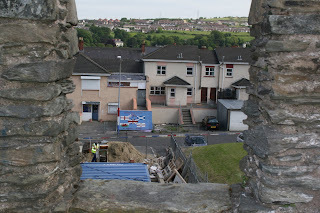 A view from an opening in the city walls of the Fountain estate, the last remaining protestant community in the Bogside. You've wrote perfect portuguese. Thank's for comming by.